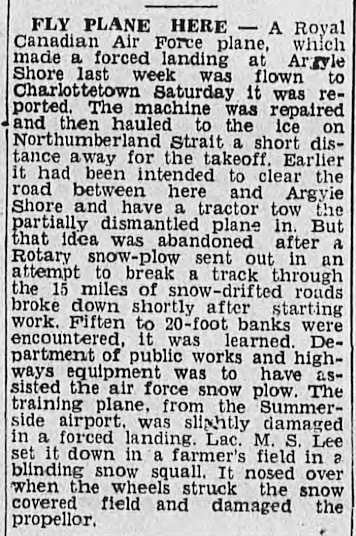 Newspaper Clipping from My Mother’s Scrapbook: Argyle Shore residents were awakened from a sleepy winter 76 years ago this week when a plane force landed in the quiet community on Tuesday, February 18th, 1941. This article was submitted to The Charlottetown Guardian and published March 4th, but the author is not identified. We do, however, have a first-hand account from Linda (Inman) MacDonald who was walking home from school along with her sister on the day the plane came down. Her account follows the story. In some lives the knock of fate is forever sounding. This time it sounded on mine, in a high pitch one, concerning an R.C.A.F. “Harvard” plane which made a forced landing near the Straits on Tuesday afternoon, February 18th, 1941. Flying blind in a snow squall, Pilot Lee of “Summerside Air Training School” saw it was useless to regain altitude, after he had come dangerously earthward, there he cleverly grounded his plane in Mr. James Ferguson’s field, suffering a broken propeller when the heavy wheels broke through the snow, thrusting the plane on its nose. The training school was immediately notified of the misfortune and sent out a helper plane which was found of no value being unable to land without damage. Pilot Lee then made connection with the Bombing and Gunnery School at West Royalty, explaining his plight 18 miles west of Charlottetown on the south coast of PEI. Flying Officer Lewis and four mechanics then set out for Argyle Shore, and after a thrilling and adventurous sleigh drive under the guidance of Mr. Mathewson, all arrived safely on 3:30 a.m. Wednesday. It is to be understood sleigh driving is a new and interesting exploit for English airmen; so for PEI Islanders, we can hardly catch the spirit of the adventure. As nothing definite could be accomplished until daylight, Lewis stationed the men on half-hour watches to guard the ship, while the remainder partook of the cordial hospitality of Mr. Fred MacPhail, Mr. James Ferguson and Mrs. John MacPhail. Wednesday brought new developments. Mr. Fred MacPhail retraced Mathewson’s 18 mile journey to Charlottetown for a new propeller; the old one was damaged beyond repair. During his absence, Mr. Earl Cook, under the direction of the aircraft men, forwarded eight “Shore” residents in attempting to move the plane out on the “broad-ice” of the Northumberland Strait. J.A. McDougall, Murchison Sellar, Neil MacPhail and Waldron Sellar then began the strenuous work of rolling the plane to a suitable takeoff position. A considerable amount of snow was evacuated, wooden rollers were used on the forepart of the plane, whilst Mr. Sellar employed a wood sleigh as a means of sliding the tail portion. In the interim, Fred McPhail had stayed Wednesday night at his brothers in Cornwall, on his return with the propeller. He was accompanied by Flying Officer Norton. The cargo arrived Thursday (2:30) where repair work was begun immediately. Some time passed during which I have learned, began the battle between snow and plane. When nearing completion on Friday afternoon (3:30) Flying Officer Webster arrived by plane from Summerside for the purpose of flying the Harvard back to school not knowing this mission was apportioned to Flying Officer Norton. The brother plan brought a large gathering, who witnessed with some regret the take-off of the newly arrived plane and the crippled ship (Friday 4:10). This last act practically points the end, yet I must not overlook the fictitious. The airmen are all that is left and now that they have fulfilled their mission they await depot transportation. In the meantime plans were running high concerning a party to be held at a nearby district that (Friday) night; when like a bolt from the blue shot a winged bird (which spelled disaster to their party) in the form of a plane piloted by Mr. Carl Burke, whose mission was to convey the remaining airmen back to the school. This being so unexpected, the airmen left with secret regret and the residents of the “Shore” considerably disappointed over their sudden departure. At 5:30 p.m., Mr. Burke glided over the peaceful landscape. Scarcely had the hum of the motor died on the evening air; when, like an aftermath, we saw Mr. Mathewson arriving by sleigh with another Flying Officer whose intention it was to drive the crippled plane which long since had departed. My sister and I were walking home from school that day when we saw a plane flying low and landing to our left over Jim Ferguson’s field, between the school and the Argyle Shore Cemetery. We hardly ever walked home from school, but we did for some reason on that particular day. I was 11 years old and my sister, 7 years old. My sister was crying, and, as her bigger sister, I was trying to be calm, but I was terribly frightened as well. I could hear other kids coming from school also crying in the distance. You see, the war was on and we didn’t get much news about the war, only a bit in the newspaper or on the evening radio broadcast. So we thought for sure the Germans were landing. Up until that day, when we thought of the war in Britain and Germany, we considered it to be very far away. I recall the pilot staying at Jim Ferguson’s, Fred MacPhail going to town to get a part for the plane and Carl Burke flying out to the shore, but my strongest memory was how frightened my sister and I were when that plane came down and the prospect of what could be happening to our lives on that walk home from school. It was a big event for Argyle Shore.